Don’t you just love autumn? There is a crispness to the air that you don’t get any other time of year. I love cool foggy mornings and warm, sunny afternoons…curling up on the porch with a good book and a great cup of coffee are pure heaven. The pumpkins this year seem to be bigger than ever, too much for my bad back to handle. The solution? Smoothfoam, of course! 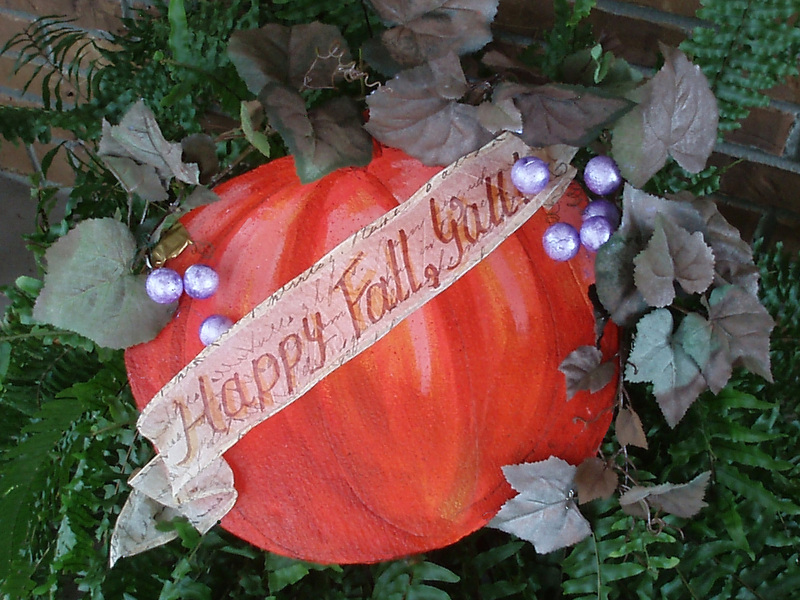 There is hardly any weight to this door or wall decoration, and it can be used through the Thanksgiving holidays. 1. Draw a large pumpkin shape on the Smoothfoam sheet and use foam cutter to cut out. Paint with orange craft paint and let dry, then add shadows as shown with brown, and add highlights with yellow and white. Paint the Smoothfoam balls purple and set everything aside to dry. TIP: Place Smoothfoam balls on a toothpick to use as a handle while painting, then insert them into another scrap piece of Smoothfoam to dry. 2. Spray paint the garland with a blend of orange and brown and let dry. 3. Write a sentiment (I used “Happy Fall, Y’all”) in the center of the paper ribbon with the marker. Bend the wired edges into a banner shape. 4. Place the garland around the top and sides of the pumpkin. Anchor into position with t-pins, then use foam glue to attach the leaves to the surface. When dry, remove the pins. 5. Attach the balls to the floral wire and wire into the garland on each side. 6. Place the banner across the front of the pumpkin and attach with foam adhesive. 7. Push an additional loop of wire into the backside of the pumpkin for hanging. This entry was posted in General Crafts and tagged Ball, Fall, Halloween, Orange, Sheet, Thanksgiving, Wallhanging by Candice Windham. Bookmark the permalink.